Úna Ní Dhongháile continued her impressive awards streak at Sunday night’s 2018 BAFTA Television Craft Awards where she picked up another award for Editing, this time in the ‘Best Editing: Fiction’ category. Ní Dhongháile was awarded for her work on the BBC One drama ‘Three Girls’, which fended off stiff competition from Peaky Blinders’ Dan Roberts, Line Of Duty’s Andrew John McClelland, and The Crown’s Pia Di Ciaula who were also nominated in the category. 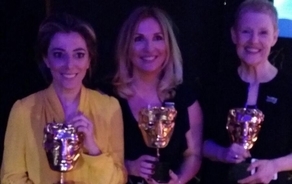 Una told IFTN, "I am so proud to have edited 'Three Girls' and I am honoured that Philippa Lowthorpe, Nicole Taylor and I received the Baftas for directing, writing and editing respectively last night. Thanks to our brilliant producers Simon Lewis, Sue Hogg, Hilary Salmon, Lucy Richer and Charlotte Moore of the BBC, we were able to give a voice to those who had been marginalised, neglected and not believed for many years, having suffered on street grooming and abuse. "We could not have made this series without the contribution of these real people, whose bravery and generosity of spirit proved to be our guiding light. I am overwhelmed by the wonderful response to the series and I feel privileged to have been involved in the telling of this important story. We share these awards with everyone involved." Úna Ní Dhongháile previously picked up an IFTA at the 2018 IFTA Film & Drama awards & the 2017 Royal Television Society Awards for her work on the BBC Studios Drama. Other major winners on the night included Northern Ireland based ‘Game of Thrones’, which picked up the special award for its contribution to television. The Swards took place on Sunday 22 April at The Brewery in East London.